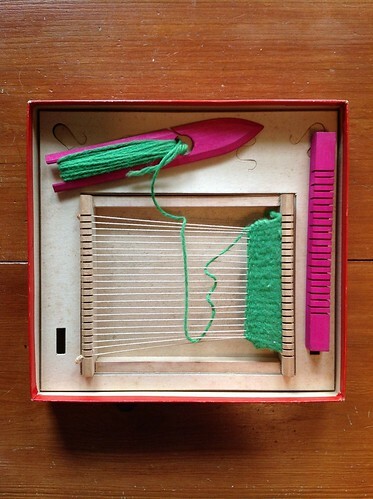 Quite awhile ago, in fact nearly three years ago, I posted what I thought was an impressive list of all the little weaving and knitting looms I had accumulated up to that time. It was just about then I started becoming interested in weaving, and I was making a pretty clear switch from knitting to weaving. 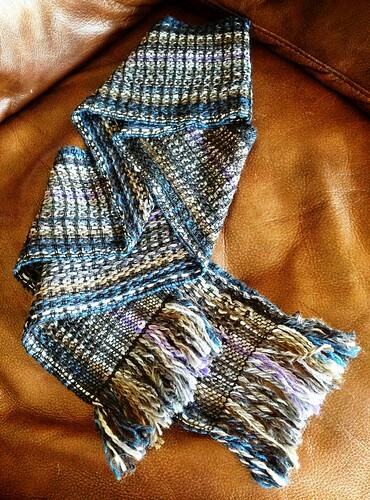 I still do an occasional knitting project, but most of my time is spent in weaving world. So, maybe it's time for an updated list? I think it's interesting that all of the looms from my old list could have probably been stored in one medium-sized plastic bin, but I still thought it was excessive. Okay, we've gone way past the medium plastic bin storage idea! For some reason–and not just because I'm running out of room in my tiny 8'x9' office–with the recent purchase of the 7' triloom, I feel I've actually come full circle. The first looms I had an interest in were the 4" square looms and the little Wonder Weave rigid heddle loom. I then bought my first triloom. 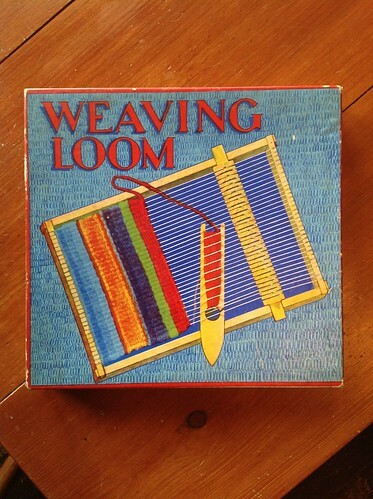 Little did I know that those simple looms would teach me the basics of weaving. From there, I let things slide, weaving-wise, until the next fall, about a year later, when I suddenly had an urge to buy a "real" loom. But first, with my inquisitive nature and with some helpful words from a Ravelry weaver, along with Laverne's fantastic series on backstrap weaving at Weavezine, I put together a backstrap loom (and chiseled my hand in the process! 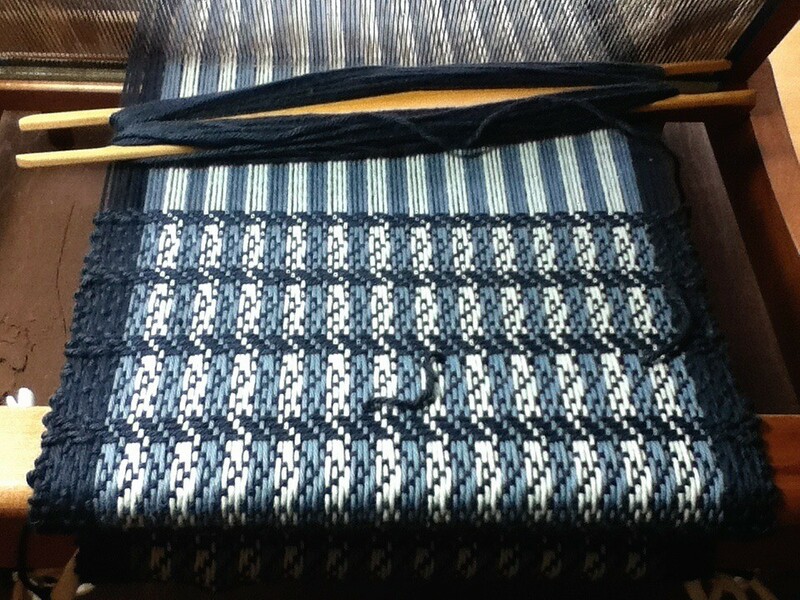 ), and figured out lifting patterns for plain weave, weft-faced projects. It was about five months later that I bought the Emilia loom. With all that said, I have two looms in the mix that will probably need new homes, the Peacock and the Kessenich. Both also need some work, but I'll post more about that in the future if I decide to wave goodbye. I know how to do a plain weave triangle, having woven several on the first loom I ever bought, a 24" triloom, but I'm now waiting for my 7 foot modular triloom to arrive, although I still haven't figured out where in the world it's going to go. 7 foot! I haven't had the best of luck when it comes to warping using the warping board. 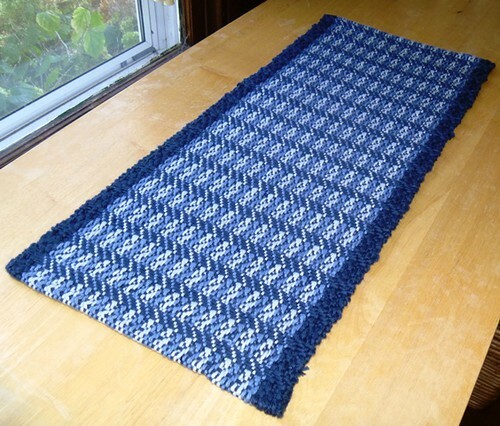 I know I can do it–and I did with the table runner project–but I still look for shortcuts. This time, I decided to combine direct warping with the board, and it worked… kind of. I got all the 142 cotton warp threads onto the Ashford table loom just fine. 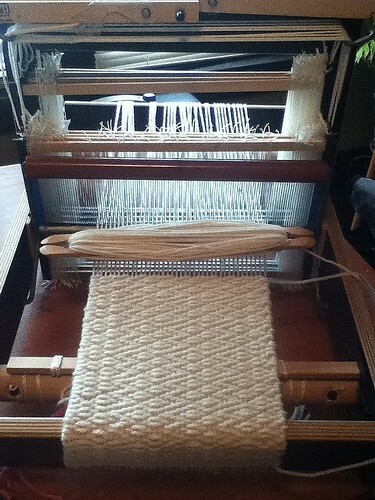 Each time, I looped over the warping bar, and I kept every five strands separated with the raddle. I didn't use the lease sticks. Maybe I should have, but I couldn't quite wrap my brain around how to do that, too. So, it all wound on very nicely, I threaded all the heddles with a simple 1-2-3-4 repeat, sleyed the reeed, and then I got ready to weave. It's here I stopped because I didn't care for the way my selvedges looked when I used two separate colors. I gain some knowledge in one area (like warping) and then I realize I still need to learn something else (selvedges when using multiple colors… grrrrr…). I like learning, and I also like weaving, which is why this is lifelong journey. You’d think I’d have about a dozen scarves after weaving for about 2.5 years, but I either give them away or decide they’re not quite right. There are two I wear regularly (in the cooler weather). 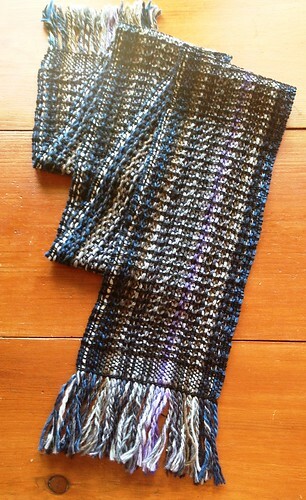 Now, there are three, because I’m crazy about this Noro Taiyo sock yarn scarf. Yes, using the yarn as a warp was a big challenge, but I love the end results. I wove this on the Glimakra Emilia after it started snapping under the pressure of the Ashford table loom. I doubled each end in the 8 dent heddle, often threading the “wrong” end, and so the color scheme didn’t stay true to the color changes of the yarn. I didn’t care one bit, because I was more worried about being able to weave the entire thing without snapping threads than whether or not the goofy colors matched up properly. The weft was black crochet cotton (size 10). I also used a pickup stick pattern from Jane Patrick’s The Weaver’s Idea Book. It’s on page 85, 5/1 warp float. The warp was sticky, tangled in numerous spots, and often plain old difficult to weave. I made mistakes, too. Surprisingly, in the end, I was so pleased with the lightweight, airy scarf, I didn’t wait for it to air dry after washing it. I placed it in front of a space heater, and 20 minutes later, the scarf was ready to go. Although it doesn't have the best images, it's a nice resource on how to get started. But it may become a pillow. The cotton (I Love This Cotton from Hobby Lobby) is very soft and squishy. It would make a nice pillow, I think. This was a fun, fast project. 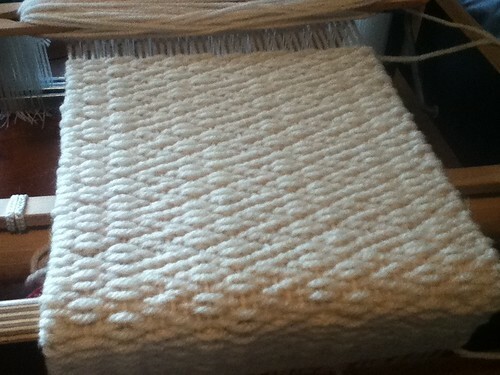 I had a nice moment when I successfully took the warp off the warping board and transferred it to the raddle. Didn't miss a thread! After that, I didn't mind the small challenges, like forgetting to have a floating slevedge. Oh well! Cotton yarn and a pattern from Anne Dixon’s four harness book. I had to get used to the plastic pawls and ratchets but they hold fine. So far, I love this project! That warp that had the snapping problem (individual strands of Noro sock yarn are delicate!) 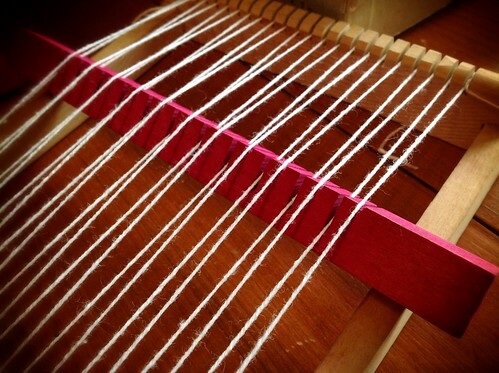 was transferred in a big clump from the Ashford table loom to my trusty Glimakra Emilia rigid heddle loom. The only thing that didn't go wrong was that I was smart enough to tie a knot at the top so I knew just where to put a warp stick. That's all that I did right. 🙂 But leave it to good ol' Emilia to take a mess and make it work out (knock on wood). Even though the warp is still a mess with tangled threads, I simply wound it on very gently and threaded each slot and hole with two strands using the 8 dent heddle. If one strand breaks, I'm still good to go. I'm using a pattern stick to create some warp floats. I think it shows off the pretty Noro colors a bit more than plain weave. The weft is black crochet cotton, very thin and strong. I decided to use one of my slim poke shuttles, and it's working out great. Because it's small and nothing catches on it, it's perfect for a sticky warp. So far, I really love how this is turning out. But I would not recommend using Noro sock yarn as a warp unless you know what you're getting into. 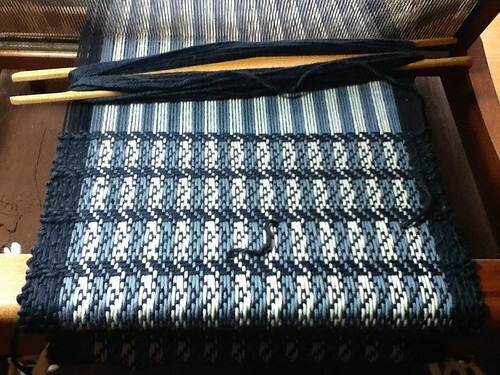 The Noro sock yarn warp that I wanted to use on my new Ashford Table Loom snapped while rolling it onto the warp beam. More than once. Maybe three, or four, or even five threads snapped! And because that happened after I cut the ends, I couldn't save it for a future weft, so I took it off the Ashford and rolled it onto the Glimakra Emilia, hoping I could use a light touch when it comes to weaving… One can only hope. Posted on August 27, 2012 Categories Glimakra Emilia, WeavingTags emilia, glimakra, heddle, loom, noro, rigid, weavingLeave a comment on Oh, Snap! Have you ever ventured into the garage to search for a piece of scrap lumber, found one, marked it up, pounded about a couple dozen nails into it, trimed off the edge with a saw, only to hear your husband say, "That was the board I was saving. It was a very expensive piece of wood." Ooops. Oh well. I really like this homemade raddle I made in about five minutes. Yes, the nails are a bit sideways, but this very expensive piece of hardwood was just what I wanted, and I can't imagine it cost more than $49, which is what the raddle kit runs nowadays. I've promised to buy another oak board for my husband, who wasn't really all that troubled, and so it works out fine. This warp, Noro sock yarn (Taiyo), will be tricky. It's slubby and I've heard it can snap, so I'll be careful. 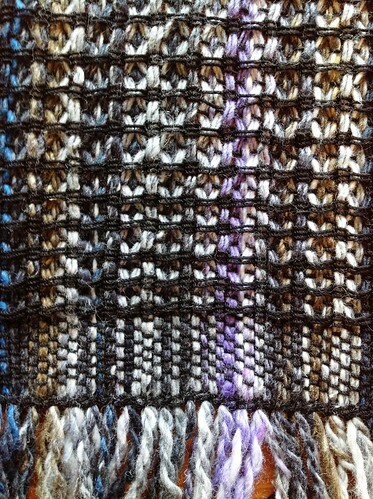 I'm wanting to weave a lightweight scarf using a crochet cotton weft in black and a spot Bronson weave. Isn't it pretty? Of course, the kitty agrees. I am playing around with four shafts on the Louet W30 loom. Believe it or not, the yarn is the old Red Heart acrylic I kept meaning to put in a giveaway box. I finally decided to use it up. I “think” this is a twill, but it reverses the patten. It’s on page 71 of The Handweaver’s Pattern Directory by Anne Dixon.